Compressibility factor of gases is a thermodynamic property which is used to modify the ideal gas equation for real gases. PV = ZnRT, here Z is the compressibility factor for the given gas. The compressibility of a gas depends on the particular gas as well as temperature and pressure conditions. Compressibility charts available in literature are commonly used for calculation of compressibility factor / Z factor. 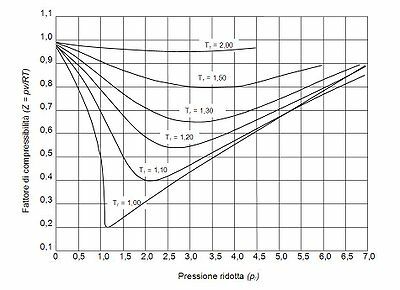 These charts express compressibility values as a function of reduced temperature and reduced pressure. For example, this compressibility factor table for air. where Tc and Pc are critical temperature and pressure values respectively. Compressibility charts are based on empirical findings. For natural gas, compressibility factor depends on - temperature & pressure conditions, composition of the gas in terms of N2, CO2 and H2S content. This calculator helps in calculation of the compressibility factor for a natural gas based on Brill and Beggs Z factor correlation.